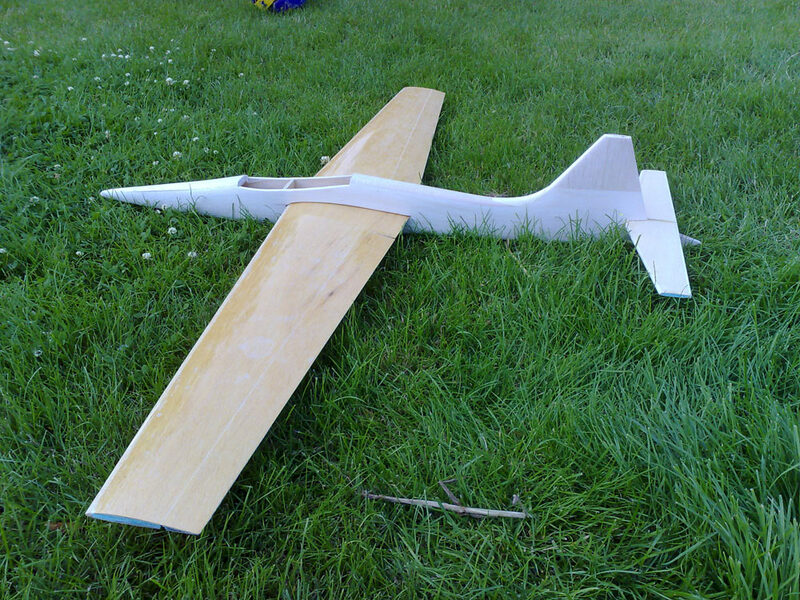 Welcome to my build of my JART. 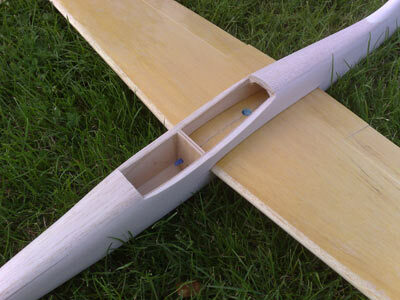 I'm going to be using foam wings and a balsa fuselage. 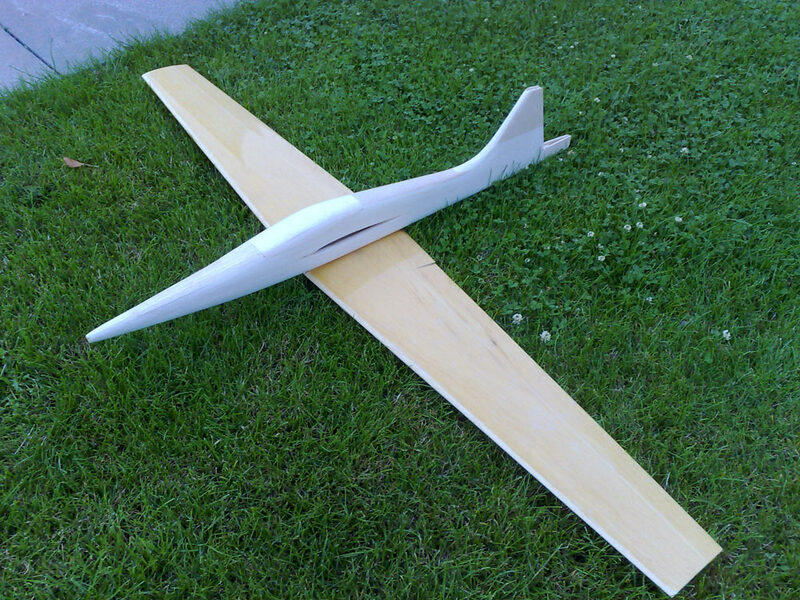 Its been a long time coming, but my Jart is finally complete. Just have the aileron connections to do and cover it in stickers. Its been a while I know but I'm back on the Jart build. Feeling guilty to be honest and I'm trying to complete some old projects that have been hanging around for a while. 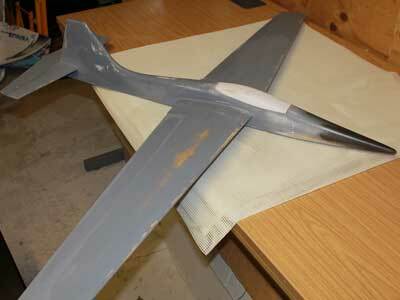 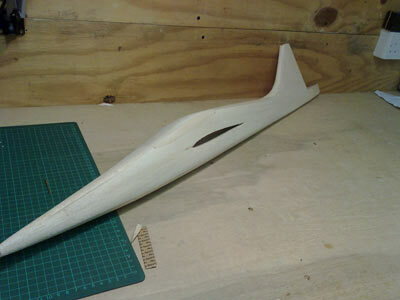 The model is now fully glassed, primed and ready for spraying. The dark grey on the nose is a tester for the final colour. 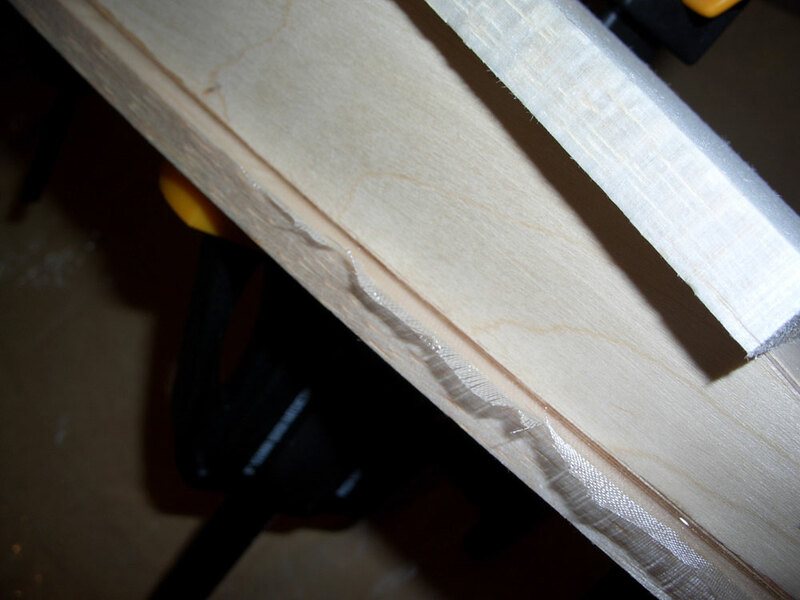 It takes a lot of sanding to find the shape under all that basa. 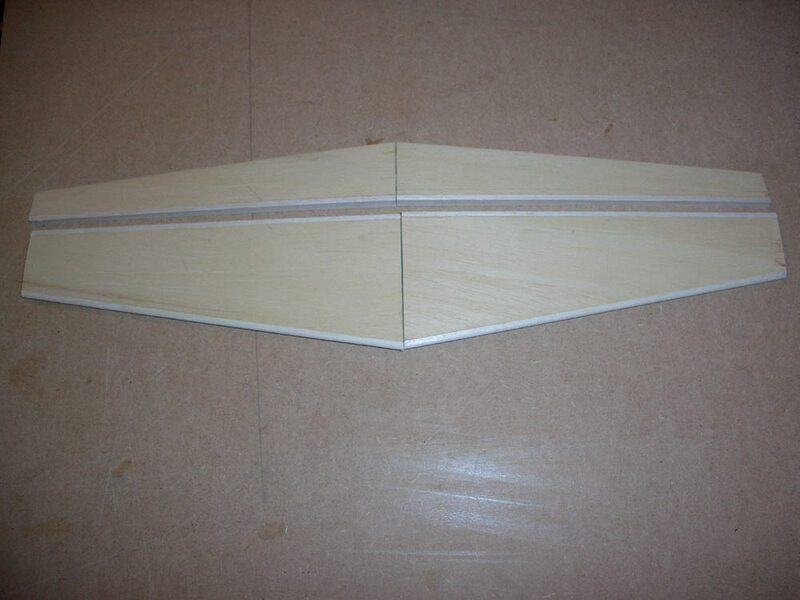 You need a lot of clamps, this is the canopy, previously cut out, it will be tacked back in place for final shaping and finishing, and released just prior to painting. 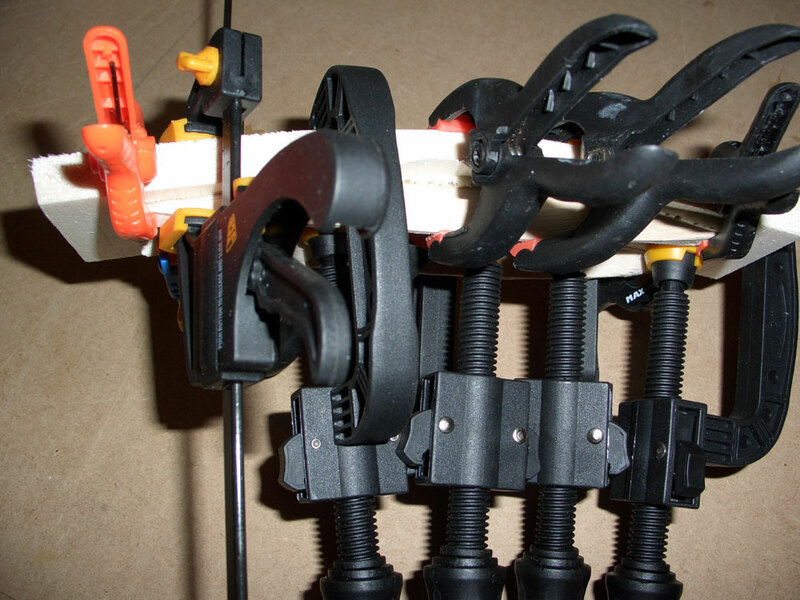 Left hand showing the glass sandwich under clamp pressure. 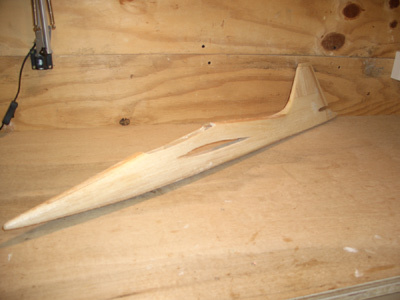 The other shows the top planking (this was 12mm as I had a length of scrap) shapped back to the fuselage side waiting to complete the planking. 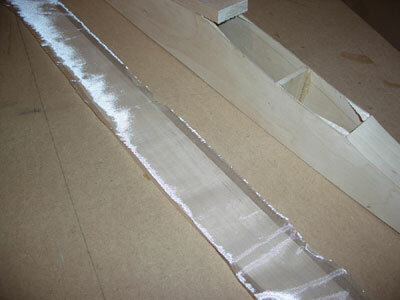 The ply box is being planked with 9mm balsa, the majority of which will be shaped away to reveal the Jart. 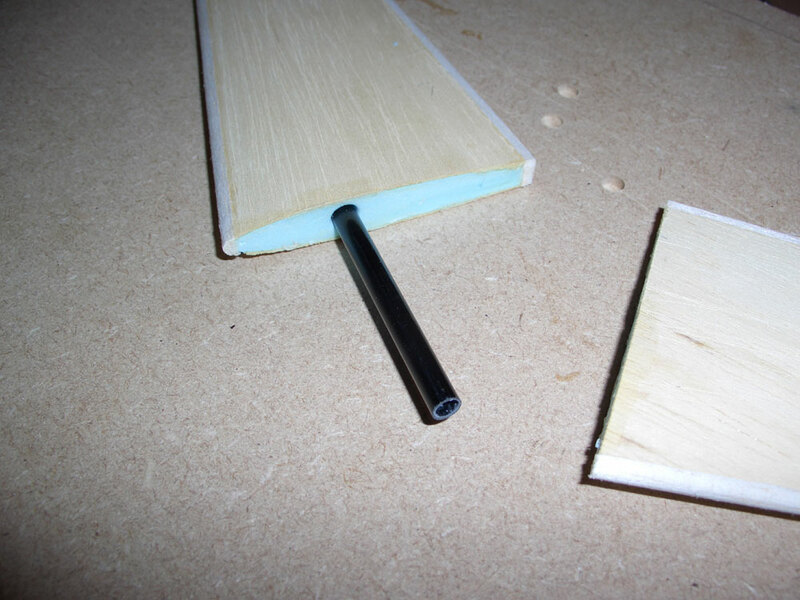 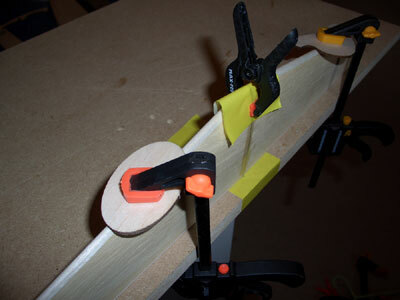 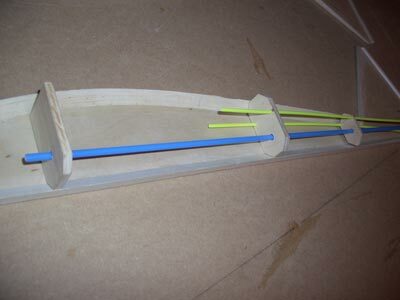 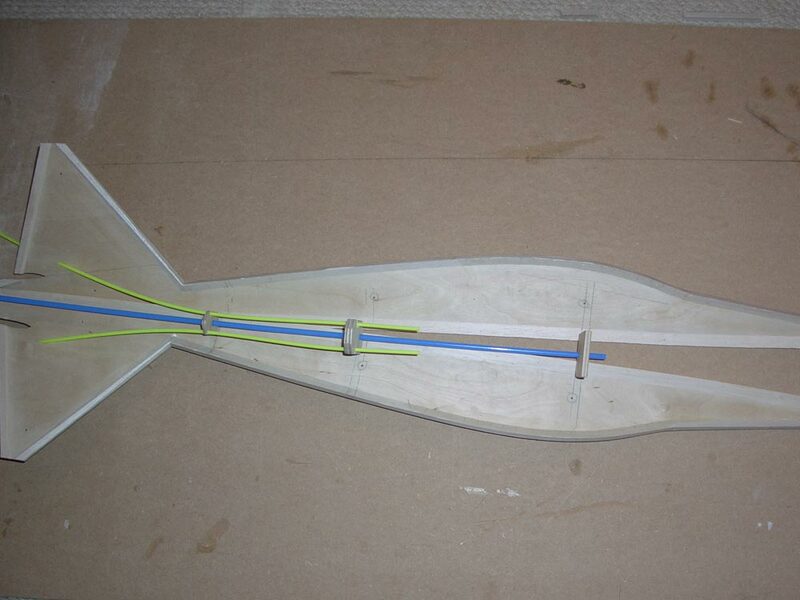 The balsa is stuck to the ply with epoxy skinning resin and 1oz glass cloth, and clampped until dry. 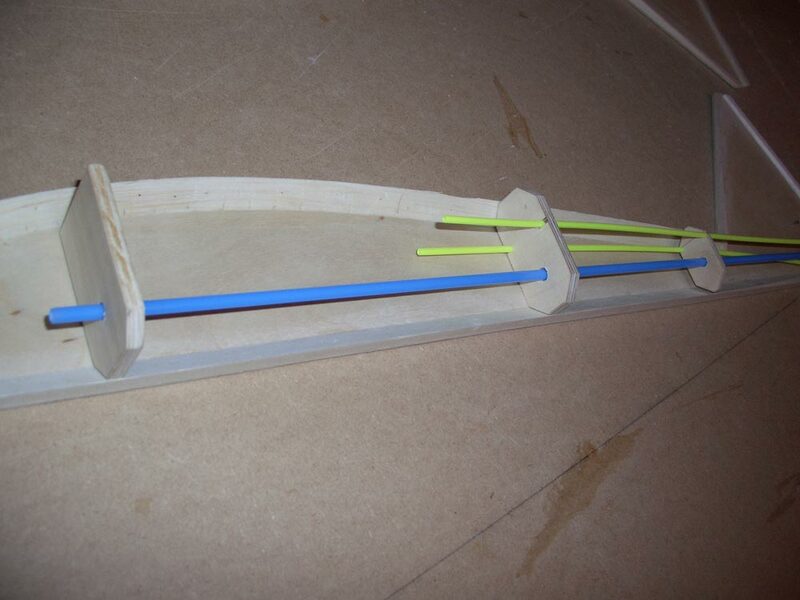 Giving a ply / glass / balsa construction. Should be strong enough!!! 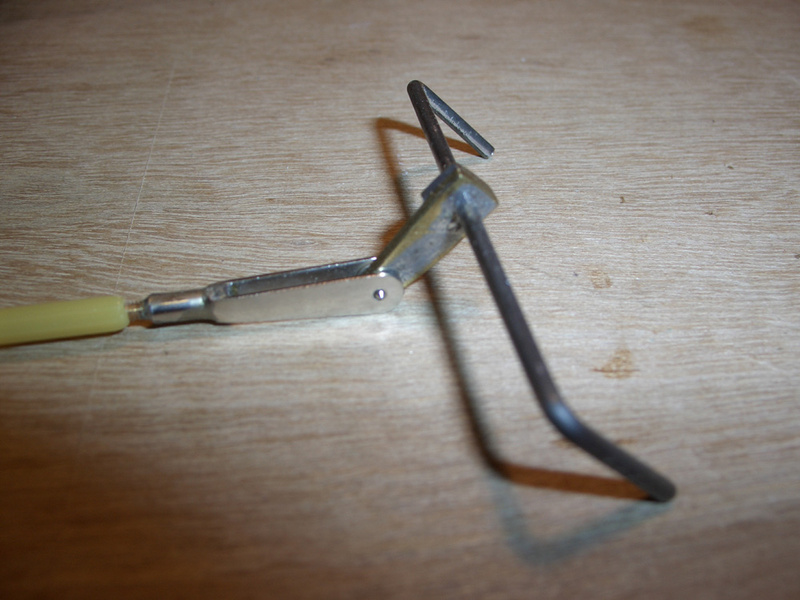 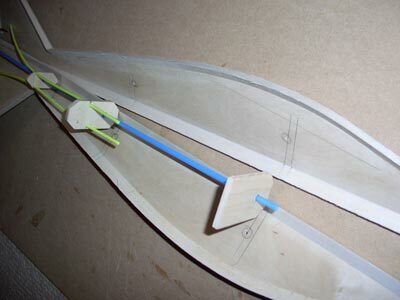 Tailpalne showing carbon rod, and clamping of tail whilst drying. 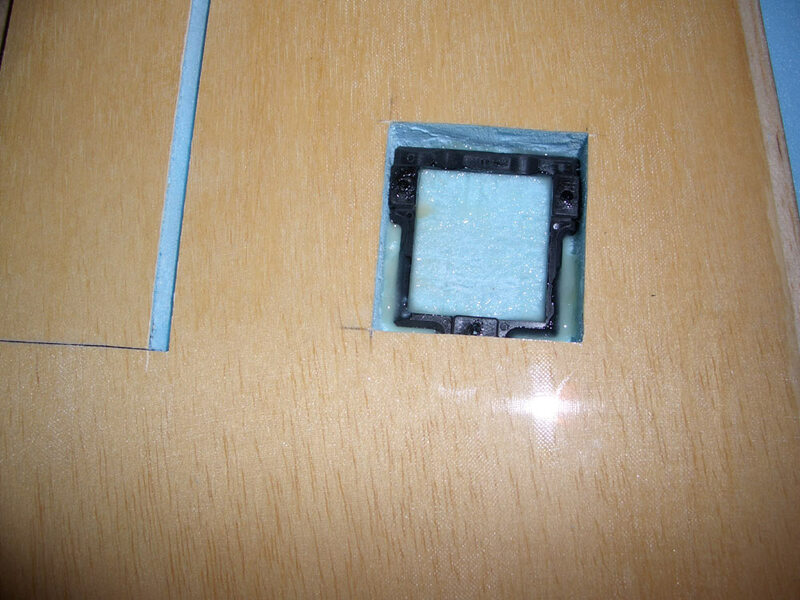 The first image is one of the panels, it's blue foam glass covered and vac bagged, with Kevlar along the hinge ine for 'live' hinges. 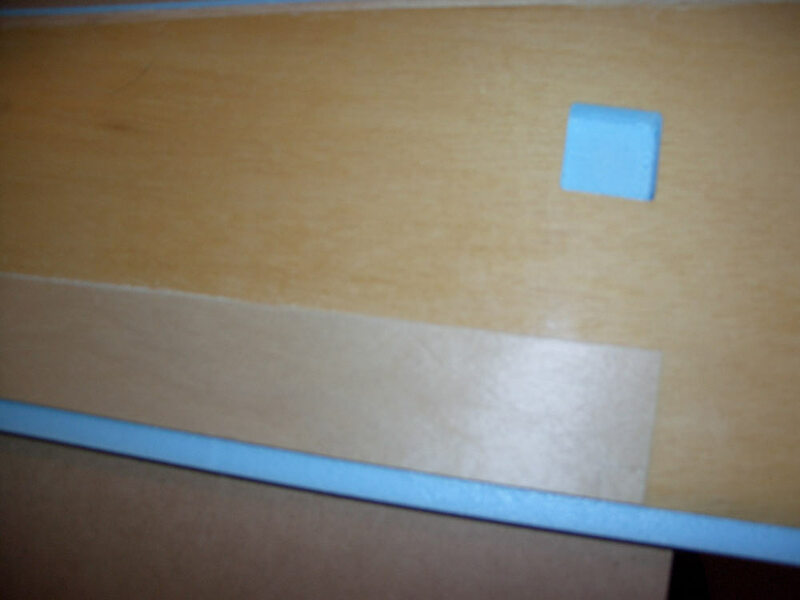 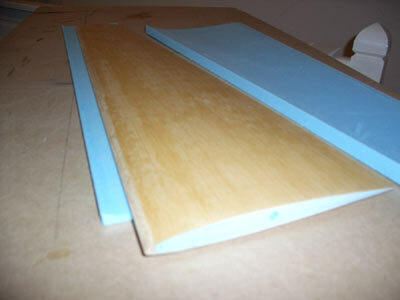 the middle is the ply aleron template, tapped into position. 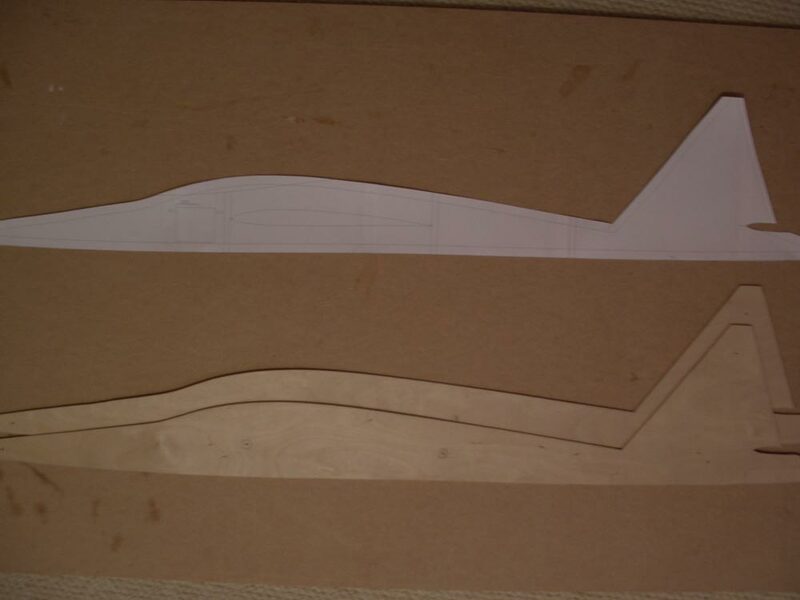 One the bottom of the wing I make 2 cuts to produce a 'vee' for the the donw going aileron, and the top I file through the skin down to the kevlar hinge. 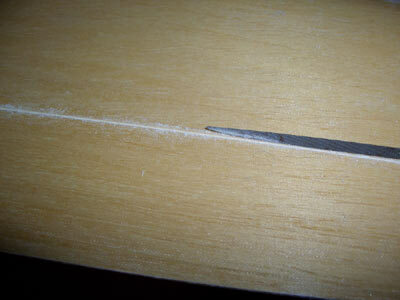 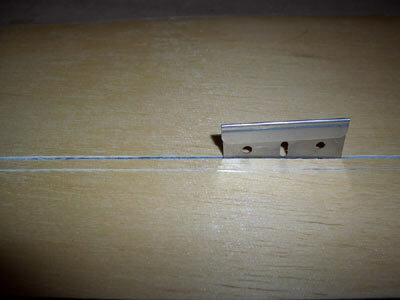 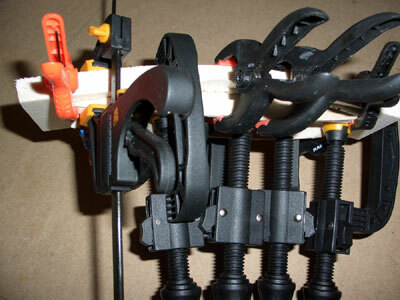 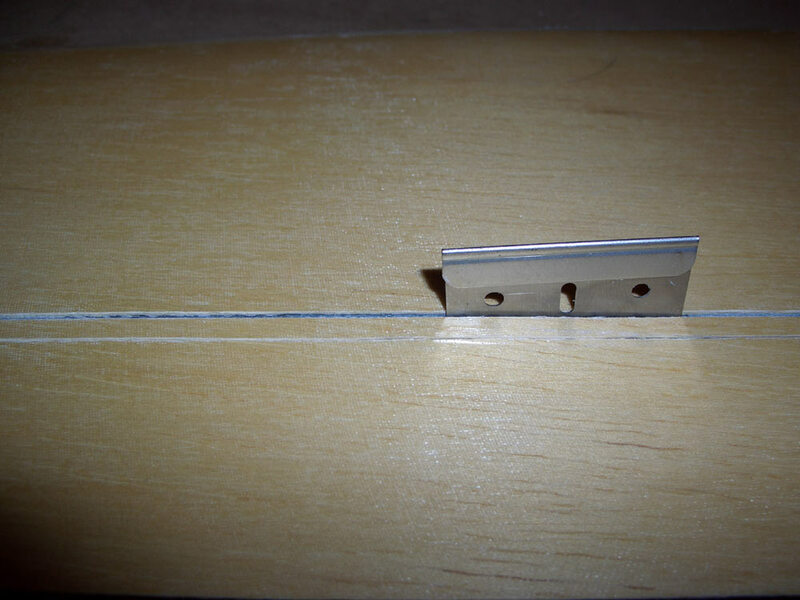 The final image shows the hinge line cut, care must be taken here not to cut through the kevlar hinge. 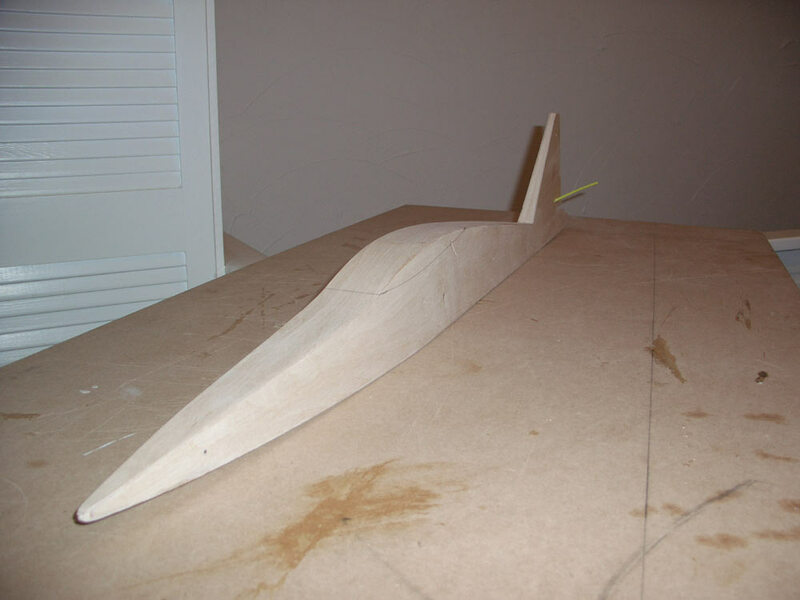 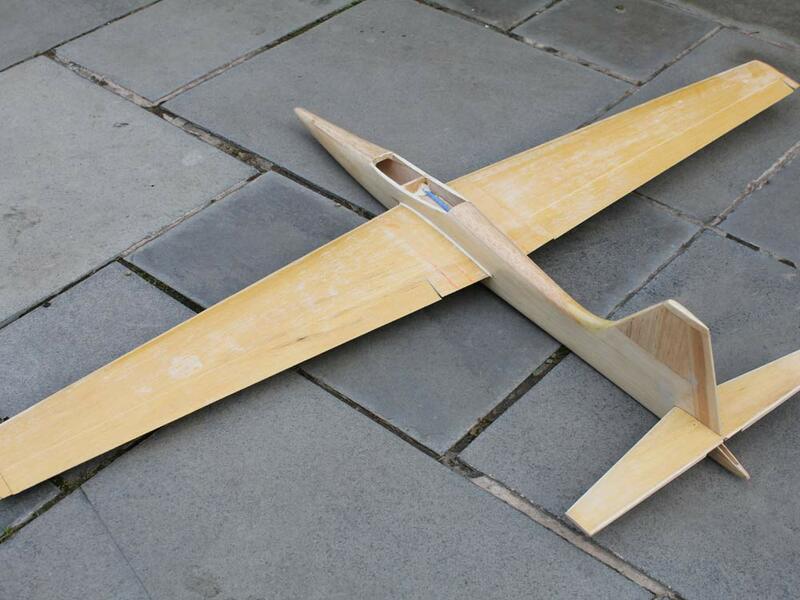 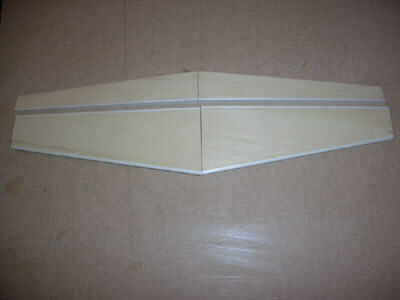 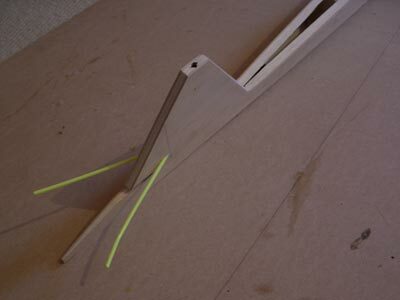 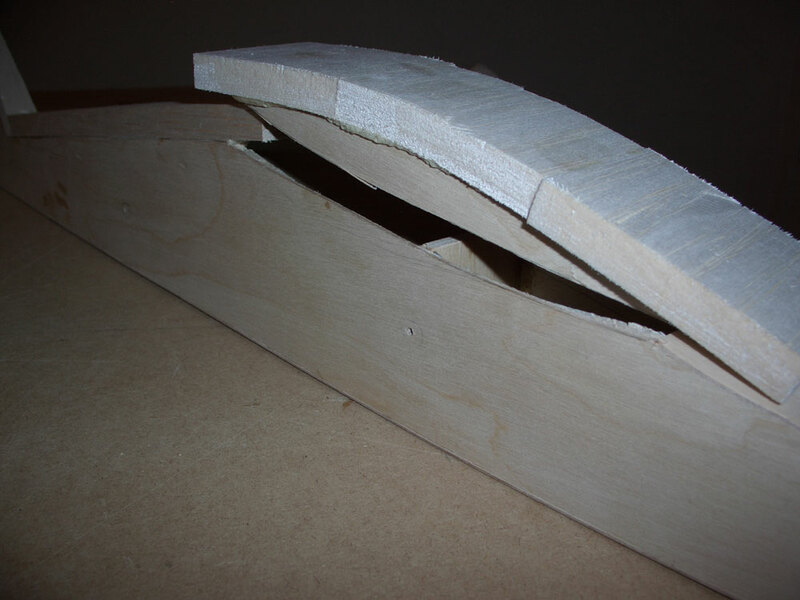 Tailplane halves with the elevators cut and the edges faced with hard balsa. 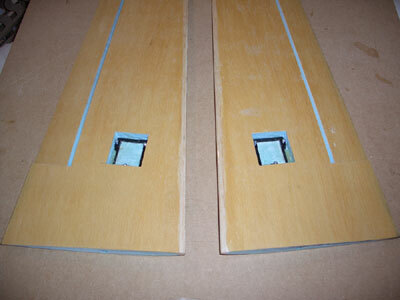 1/16 ply tops and bottoms fitted and sanded. 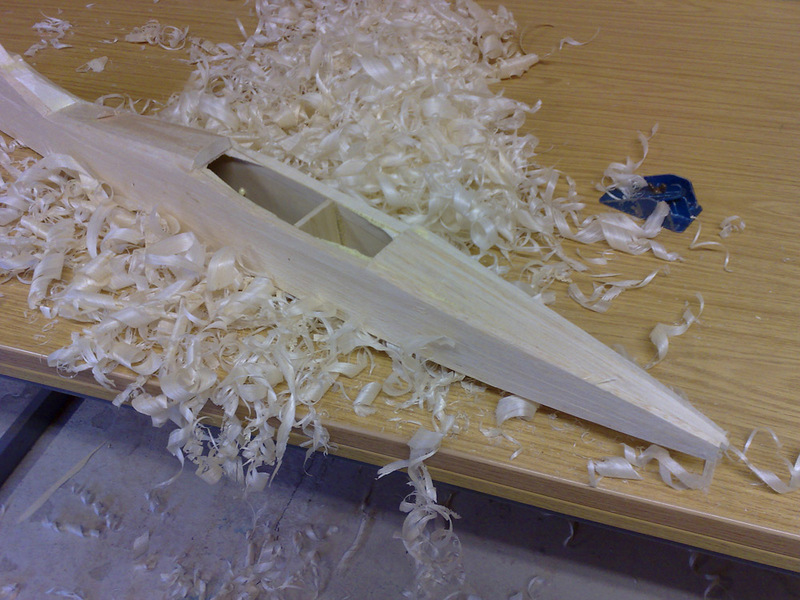 Waiting for the balsa sides now to shape, but if you squint, you can see a JART in there somewhere. 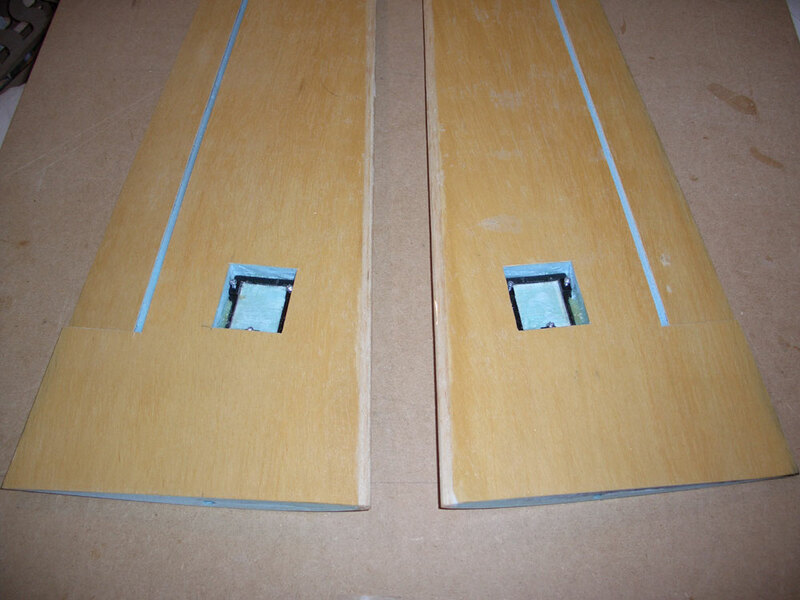 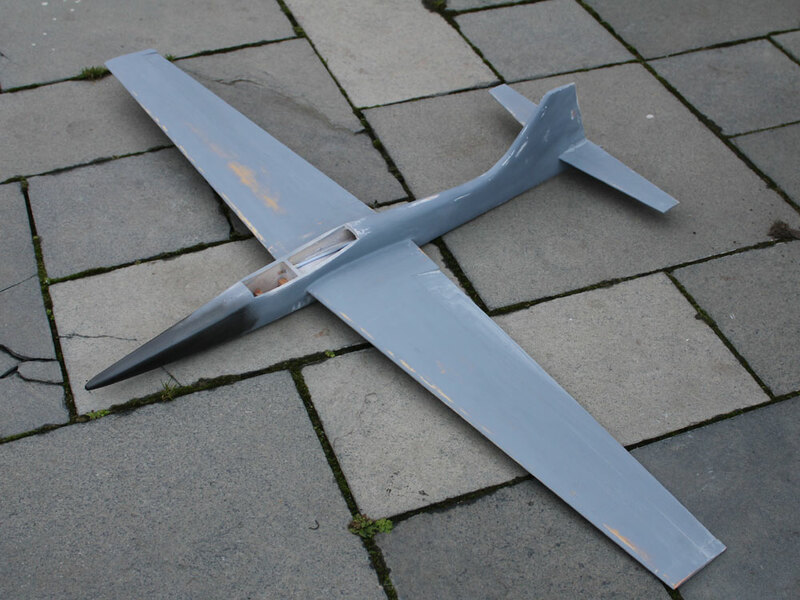 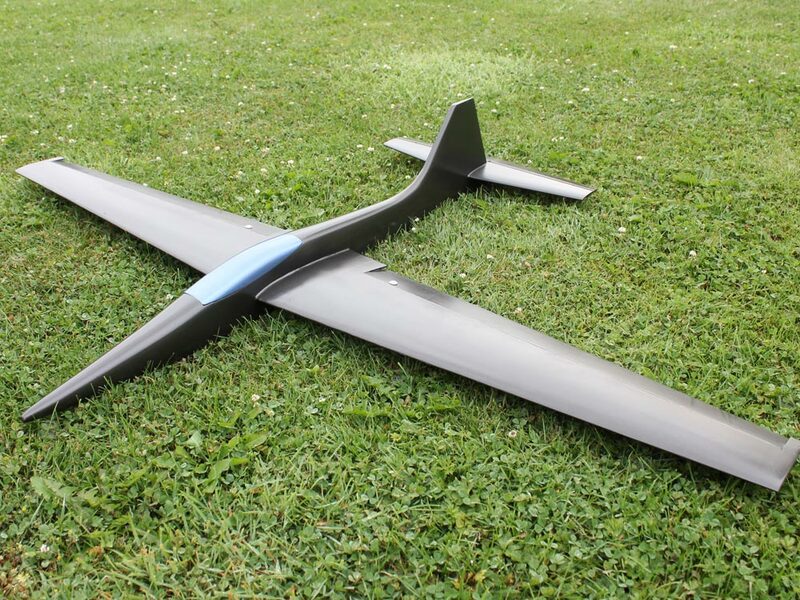 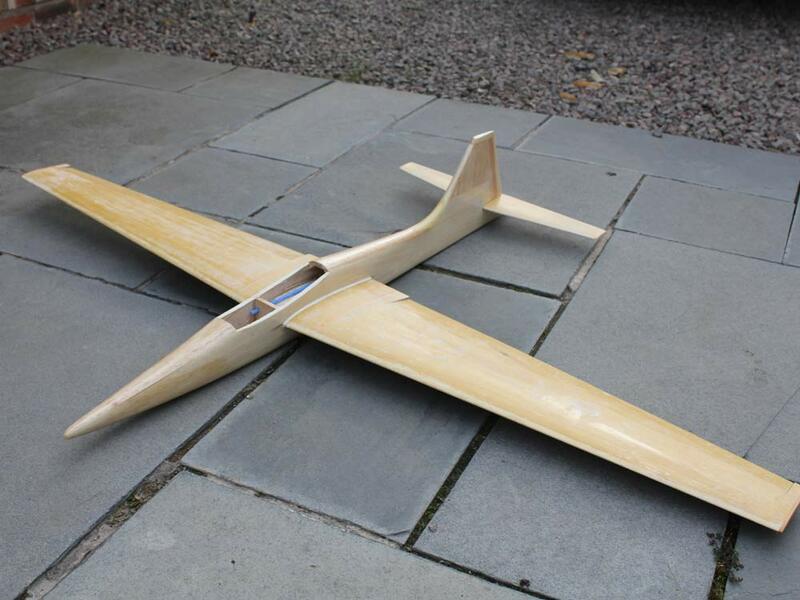 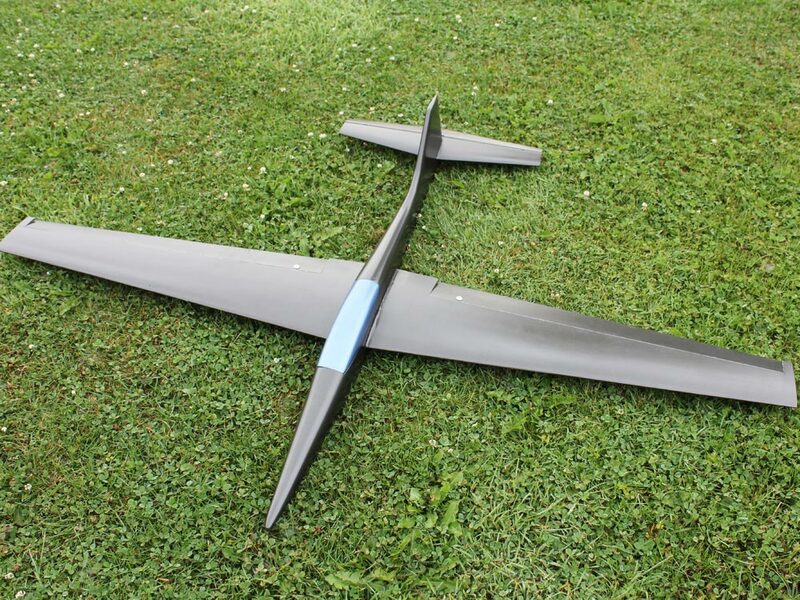 I used 24 hr Araldite epoxy, a) to give me time to position the parts in my fuselage jig (a home made version of the SLEC one) and b) There is no better glue if a high strength bond is required. Formers cut and snakes fitted, opted for snakes to keep as much wood in the formers for strength, the blus one is a Sulivan for the elevator and the 2 yellows are guides for the rudder closed loop. I cut a template form the CAD drawing, and marked around it to produce 2 ply sided. 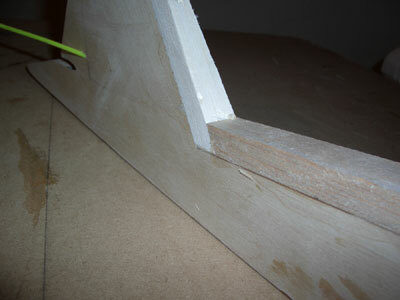 Note the holes in the sides. The 2 shown are the le & TE points so I have a datum on each side. 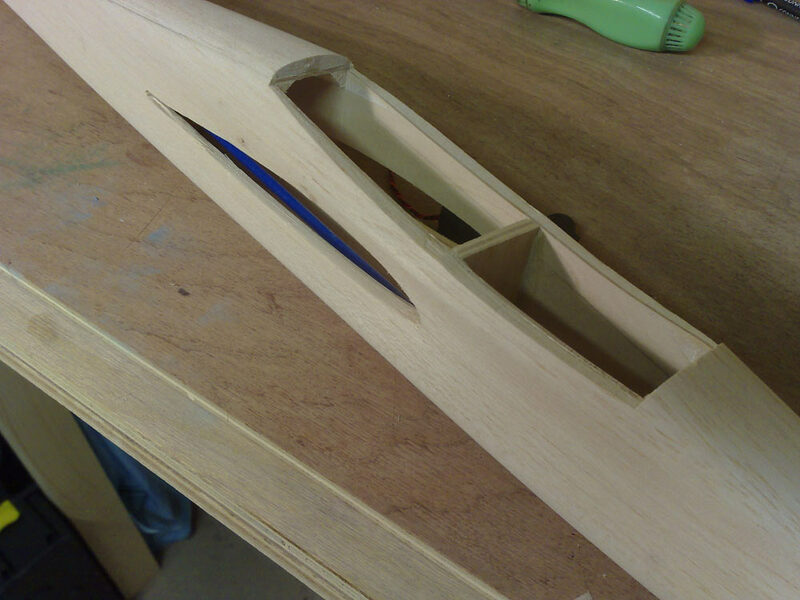 In addition there are 3 more holes i at the nose and 2 at the tail to help alignment when I join the fuselage sides together.